In this article we will explore everything that you need to know in order to resize your engagement ring. Below is also an explanation of the techniques that jewelers will typically use when resizing your ring. How to Resize a Ring? 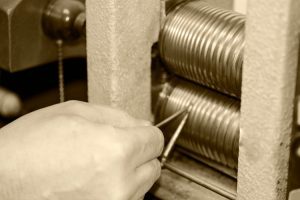 There are two common techniques that are used when sizing a ring. The first resizing technique is applied by stretching the metal. 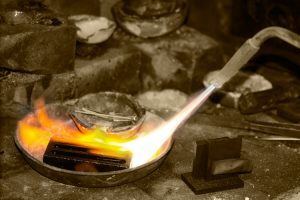 The jeweler heats the bottom of the ring and stretches it until the ring reaches the desired size. Often, the ring will incur damage during the stretching process, and it is for this reason that we discourage this technique. The second technique involves cutting the bottom of the ring and adding a metal bridge. This techniques helps preserve the integrity of the ring and most importantly, does not effect the strength of the ring. We almost always suggest this method. The cost to resize your engagement ring should cost anywhere between $100 – $150. Jewelers will sometimes choose to “add shots” to the ring instead of resizing. Adding shots is accomplished by soldering two balls to the bottom of the ring in order to constrict the space where the finger is placed. These “shots” are a little uncomfortable at first, but are completely unnoticeable after a few days. It shouldn’t cost more than approximately $75 to add shots to your ring. Does Resizing the Ring Harm its Integrity? No. Resizing a ring will not affect the integrity (or durability) of the ring. Rings, like clothing articles, will usually need to be tailored to fit the needs of the wearer. Luckily, in the case of the ring, resizing it a few times will have no consequence on the ring, as long as it is done by a professional jeweler. Resizing vintage rings also will have no impact on the integrity of the ring. The jeweler may need to be a little extra careful, but otherwise there is nothing to worry about. The only time when resizing may have consequences is when their is extra (or custom) jewelry work needed in order to resize it. One of the biggest obstacles for those trying to plan a surprise proposal is getting her ring size without creating any suspicion. If you want to know more about surprise proposals, you can read our proposal guide. If she is not a suspicious type of person, you can just casually ask her finger size. You can ask her friends and family. Wrap a piece of string around her finger while she is sleeping and measure it. Have an already-engaged friend let her “try on her ring for fun” and gauge her size based on the ring. In the worst case scenario, you can eyeball her fingers. The average finger size among women is size 6.5. If her fingers are a lot larger than her friends, you can assume that her finger size is larger than a size 6.5. In the case that she has smaller fingers, it is likely that her finger is smaller than a 6.5 size. If you end up guessing the wrong size of her finger, you don’t have to worry too much about it. Once the proposal is over, the jewelry company (if they are a respectable company) will re-size the ring to her exact size, at no extra cost. Curved metal will also require a band size adjustment, depending on which direction the metal curves. If the inside of the band curves inwards (towards the finger) or outwards (away from the finger), it could possibly greatly effect the size of the ring. The best advise is to always attempt to try the ring first. If that is not possible, try to ask the jeweler or company how much the size would change based on the rings design. In the worst case scenario, you can always send the ring back if the wide shank created a confusion in size. In addition, to the aforementioned problem of calculating wide bands, intricate wedding bands usually present another big problem. Detail. Most intricate wedding bands have motif designs and patterns that wrap around the entire perimeter of the shank. These rings are usually not sizable. Please be very careful when you are resizing a ring with a continual design. 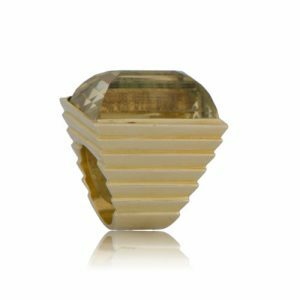 Unless the ring is a one-of-a-kind piece, the ring will usually be available in different sizes, and if the ring doesn’t fit, the jeweler will provide the another ring that is in a larger or smaller size. In some cases, (if the ring is a lot smaller or a lot larger,) the jeweler will have to remove an entire section of the pattern in order not to ruin the continuity. Can the Finger Size Change Size? It is very common for a person’s ring size to change. There are many reasons that the ring size will change. Some people experience ring size changes based on the season, and they will need to change their ring at least size twice every year. Pregnancy is know to greatly effect ring size. Losing or gaining weight will often change the ring size as well. It is also very common for people not even realize that their ring size is changing and risk their ring slipping off their finger or getting stuck. We strongly advise our customers to pay attention to their rings every-once-in-a-while to ensure that the ring is fitting properly. How long does it take to resize a ring? Unless the resizing process is very complicated or difficult, the resizing process should not take more than a day. If there are recurring designs, or any custom jewelry work required, the ring sizing process may take longer. 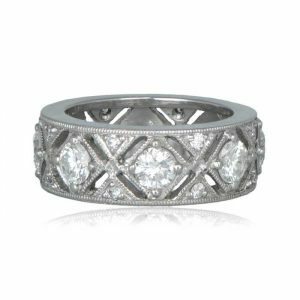 Estate Diamond Jewelry offers free resizing on all of the rings in our collection. We will also resize your engagement ring if the ring still doesn’t fit, at no extra cost. Another jeweler will need to resize the ring, if it is not from our collection. We always strongly caution to only use a jeweler with the highest recommendations. There are many things that can go wrong when resizing a ring and only a professional jeweler will be able to properly ensure that the ring remains in pristine condition. A good jeweler will also check all the stones on the ring to ascertain that they are all secure. Resizing a vintage engagement ring will usually be a lot more complex than resizing a modern engagement ring. Only a jeweler with a lot of experience with antique jewelry should attempt to resize a vintage ring. There are many variables that one needs to know when dealing with vintage jewelry. Someone who doesn’t know what to look out for will undoubtedly damage the ring. Click here to peruse Estate Diamond Jewelry’s collection of rare and fine engagement rings. If you have any questions, please feel free to ask us in the comments below!